A tattoo by Joey Nicholson. Photo courtesy of the artist. 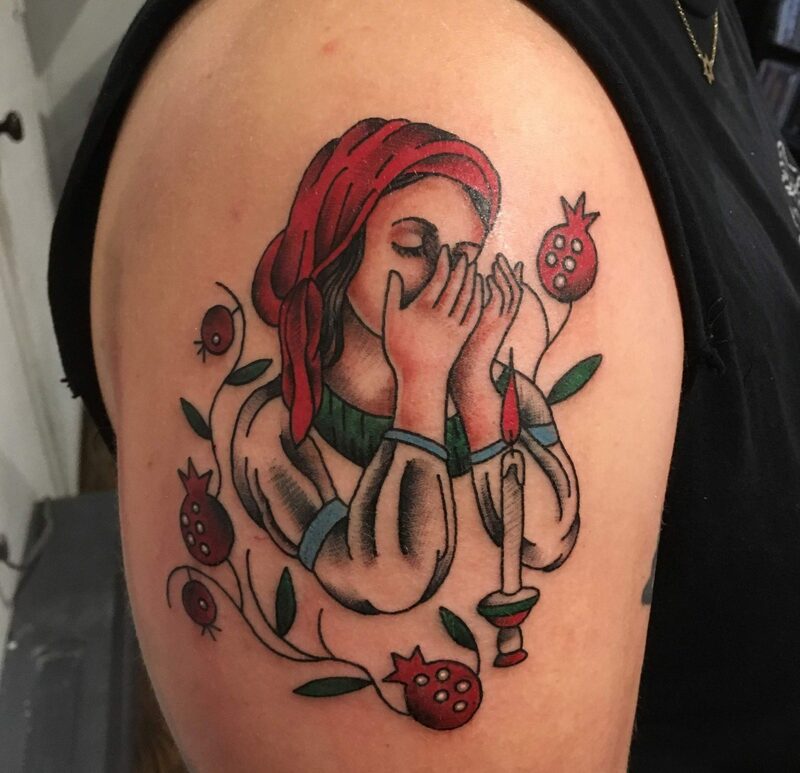 Joey Nicholson, is queer, Jewish tattooer based in Toronto. For 11 years, Joey has made bold, American tradition-themed tattoos, oftentimes with Jewish symbolism. I spoke to Joey about their distinctive artwork and about tattoos as a means of processing grief and Jewish identity. All of the images accompanying this article were provided by the artist. Isaac Brosilow: What are some of the ways that your Jewish identity finds expression through tattooing? Joey Nicholson: I started making tattoo art about my Jewish identity as a way to work through it on a personal level. I assumed no one would be interested in it, but I was wrong. Since I started doing it, all these people have been coming to me to get Jewish tattoos from a Jewish tattooer. It has brought a tremendous sense of community, which is something I’ve always looked for. Most of the feedback I get, even from people that aren’t Jewish, is that there is a spirituality in it they might not get through other types of tattoo art. My mom is Jewish, my dad is not. He’s an Irish immigrant from Northern Ireland and you know, religion probably played an oppressive role in his life. So, I had a conflicting view of my culture. My parents didn’t want religion to govern my life too strictly, but even as a young child, I felt very connected to Judaism, probably because I was so close to my mom’s family. We are Eastern European and we have strong family values. Even if we act like we don’t want to be around each other, we always are. Even as a kid I recognized that, and though I had other kinds of identity issues, I felt like Judaism was a part of me that nobody could take away. IB: How did you start finding the images and influences to create your own Jewish tattoos? JN: I was mostly influenced by art that I saw on Jewish objects, like seder plates, kippot, mezuzahs—all of these beautiful, folky, floral patterns. I see those images come up in other cultures—it’s a popular [style] in Eastern Europe—but specifically the combination of the Hebrew or Yiddish with these florals inspired me whenever I looked at them. I remember the seder plate and the Haggadah that we had in my family, the bold lines were so reminiscent of tattooing for me, it jumped off the page. I felt like these were perfect tattoos, almost as they are. So that’s where it started for me, and I started pulling in some other, figurative stuff. A couple of my pieces have women in them, especially because I like to honor the matrilineal component of Judaism, which ties in with my own feminist beliefs. Ketubahs are also a source of inspiration, I spend a lot of time cruising the internet looking for Jewish objects. IB: You recently tattooed your mom. IB: What was that like for you? JN: It was intense. We lost my Zayde last August and, to be honest, it affected me more profoundly than I could have imagined—I think my whole family feels the same way. It almost gets worse over time because it becomes more clear that he’s not going to come back, and the family’s dealing with that [each] in their own ways. For my mom, she wanted to have that image tattooed. So it was a special experience to do that for her. My Bubbe’s still alive, so right after we did the tattoo, we went to meet her for dinner. It was obviously kind of nerve-wracking because I wanted her to love it. As far as Bubbes go, she’s very open-minded about tattooing. And she saw it and she cried, and we cried. It was a positive way of honoring someone that we love so much. In terms of grief, tattooing helps a lot of people. And I do a fair amount of memorial tattoos, I have throughout my entire career. But on a more personal level, tattooing has helped me process my own grief. My grandfather was the patriarch of our family; he was like a human encyclopedia for all things Jewish. Anytime I had a question about anything I could always ask him and he always had so much to tell me. Being able to express those feelings through the tattoo art I’m making has been helpful and soul-affirming. I’ve had other Jewish folks reach out about losing their grandparents and how it affected them. And being able to reflect on Jewish mourning practices in my personal life and in my professional life has been deep and meaningful to me. IB: What excites you about what you’re working on currently? JN: I feel like I’m in an exciting moment right now, I’m starting to get what I was always looking for, which is a sense of community with other young Jews. Every time I do another tattoo on a Jewish person, my life feels a little more enriched, if that’s makes sense. I’m also looking to do more paintings exploring some of the less commonly talked about aspects of Judaism, like the fact that other genders are recognized in the Torah, and the ways that women do hold a lot of power in this religion. IB: Does antisemitism factor in in the tattooing world? JN: I feel that antisemitism has been normalized in our culture. Especially in a community like tattooing, where a lot of right-wing ideas persisted unchallenged for so long until people started talking about them. I do think that maybe my expression of Judaism has perhaps made some people uncomfortable. Because people are often very ignorant about it, and also because of people’s feelings about Israel and association of Jewish folks with Israel. I feel like what I do puts me in a vulnerable position, because when you’re exploring your spirituality and your culture, you’re leaving yourself open for some harsh criticism. Not everyone is comfortable sharing things as deeply as I am, and sometimes people deal with that discomfort by coming at you. In the past this has come up, especially with people who are used to a tattoo industry which has traditionally been more rigid in terms of deep personal self-expression, and who have often viewed vulnerability from a tattooer as unprofessional. If you disrupt that, people are going to have something to say about it. IB: What are some of the misconceptions about being a Jewish tattooer? JN: One thing I’m admittedly sick of are the generalizations like, “What are you going to do when you get older?” and “What about tattooing and the Holocaust?” I don’t want to talk about these things all the time; it can be dehumanizing. It’s nice when someone approaches these questions thoughtful and respectfully, because we are talking about people’s bodies here, and there’s a lot of politics wrapped up in that. I want to explore and approach those politics with consideration and nuance and kindness. Because the thing I’ve always wanted is to be around others who feel a deep connection to being Jewish, and tattooing is one way for me to do this. Isaac Brosilow is a writer and Jewish educator living in Chicago.